Brazilian top human virgin hair body wave bundles with frontal. Made of 100% Brazilian human hair, the hair weaves are very close to your natural hair, and how many bundles do you need for a full head of hair? We suggest you purchase three hair bundles in suitable length, however, sometimes three bundles are not enough for a full head, so it is a good idea to buy an extra piece of lace frontal or closure to add volume and thickness. 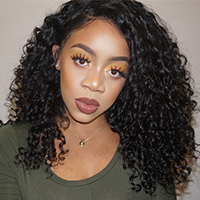 The body wave lace frontal is more expensive than other body wave frontals because there is a silk base in the center of the lace, this silk base makes the lace frontal look more natural. The whole piece of lace is measured to be 13*4 inch, while the silk base on top is 4*4, this is a very special lace frontal made for women who have etra requirement on hair. New Star Hair not only offers great quality human virgin hair extensions, our after-sales service is also first-class, here you can get the best shopping experience.